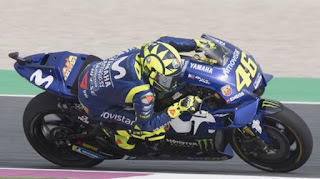 Movistar Yamaha rider team, Valentino Rossi, admitted satisfied with the performance of his motor riding motorcycles displayed during the Qatar MotoGP race on Sunday (18/3/2018). Although it had appeared inconsistent, this time Yamaha M1 motorcycle managed to survive until the race ended. It answered the concerns of Valentino Rossi and Maverick Vinales who have been always complaining about the performance of tires. "This bike is going very well, either up front when you enter a bend or in a change of direction as it moves with weight," Valentino Rossi told BolaSport.com from Tuttomotoriweb. The Doctor praised the Yamaha M1 motor which he called capable of performing fast and reactive. Although satisfied, Valentino Rossi is still highlighting Yamaha M1 acceleration which he thinks inferior compared to other teams. "We have to press, because in our current acceleration is inferior We have to fix it, it's been a long time since I told him,"
"We hope to improve ourselves and compete with them (Dovizioso and Marquez)," Rossi added. In the race that took place at Losail Circuit, Qatar, Valentino Rossi managed to end the race in third position. While Andrea Dovizioso (Ducati) won the race and followed Marc Marquez (Repsol Honda) in second position. Results in Qatar put Valentino Rossi in third place standings MotoGP 2018 rider with 16 points. 0 Response to "Finish Third in the GP of Qatar, Valentino Rossi Soroti This weakness on the Motor"